This is a collection of the various paintings, drawings, and pieces of fan art that you’ll find scattered throughout this site. Making art is like writing a love song to the beauty of…being alive. No artist was ever inspired to scratch graphite onto paper or lay pigment onto canvas who wasn’t in love, or devastated by sorrow, with the miracle of being alive, sentient, able to experience all of the landscapes and views, colors and splendor. Making art with a loved one is transcendent. The painful part is when love fails. I have a catalogue of photographs, drawings, paintings, of all of the women I have loved in my life. When the relationship fails there are hard feelings and bittersweet memories, and we tend to tell stories of the mayhem and anger and frustration – but I have all of these documents of the good times, and I can’t deny that those good times actually happened. It kinda keeps you honest, you know? We want to paint a picture of that jerk, that dysfunctional person, that demon – but at the end of the day, we were once in love with them, weren’t we? And social media is extending this, where we can all look back at the jobs that were lost, relationships that ended, sunrises and sunsets that we will never see again. I am nostalgic about yesterday, for God’s sake. I am riddled with sadness, almost all of the time. Because, at the end of the day, it has all been good, and memorable, and inspiring. And I continue to make artwork and celebrate the experiences I’ve had with those that are close to me, because I have to believe that maybe this time the story will last longer, that feelings won’t turn sour, that the world is going to be okay, make sense, turn out okay. That’s how I feel when I am with this woman. I feel light. And I feel comforted. And I feel inspired. And there’s no greater feeling than having the love of a good woman. No greater feeling at all. The list of complaints about last years’ ‘Suicide Squad’ is a long one. The machined-gunned roll-call character introductions, the underdeveloped personalities, the ethnic stereotypes, and the ‘walk like an Egyptian’ Enchantress – and this is just to scratch the surface – earned across-the-board negative reviews and a deeply conflicted audience. One of the biggest complaints I’ve been hearing? The prison-tatted goth-juggalo Joker. And while this version of The Joker has earned such disdain, Jered Leto’s performance has simultaneously garnered some of the film’s highest praise. In fact, many moviegoers are hopeful for a ‘Joker & Harley’ stand-alone movie(although this is looking less likely with the announcement of ‘Gotham City Sirens‘). Audience responses to both the film and this new iteration of the ‘ganagster’ Joker perfectly illustrates how polarized audiences are. What many moviegoers aren’t aware of is that The Joker has undergone several transformations over the last seventy-five years. After Batman was given his own stand-alone comic title in 1940, creator Bob Kane needed to introduce a new villain. Interestingly, The Joker was initially supposed to die in the first issue – with a knife through the heart – but the decision was ultimately made to keep The Clown Prince Of Crime on deck as a recurring character. It’s easy to assume that the earliest depictions of The Joker would more closely resemble the 1960s television series – whimsical and cartoonish, rather than sociopathic and violent. The truth is, in his earliest story arcs, The Joker was a ruthless killer similar to more recent cinematic portrayals. It wasn’t until editor Jack Schiff was hired that The Joker’s persona was softened in order to market the Batman comics to a younger audience. After the establishment of the Comics Code Authority in 1954, The Joker was nothing more than a puckish, thieving trickster. Editor Julius Schwartz took the reigns in 1964, leading to the near-abandonment of The Joker character altogether. Evidently, Schwartz wasn’t a fan of the character. If it wasn’t for the 1966 Batman television series, The Joker might have faded into complete obscurity. The show was a hit, however, and actor Cesar Romero provided the first ever live (non-comic-book) performance of the iconic character. After the end of the television series – and despite its success – comic sales were flagging. The Joker was reintroduced in 1973, after a four year hiatus and a decision to change formats. Editors wanted to begin telling more mature Batman stories and shed the whimsical camp of the 1960s. This reincarnated Joker was brought back to his original concept: a ruthless serial killer on equal footing with The Caped Crusader. He was also, for the first time ever, depicted as being completely and undeniably insane. Indisputably recognized as the creator of gonzo journalism – a subjective amalgam of fact and fiction – Hunter S. Thompson is one of America’s greatest chroniclers. Not just of tequila-soaked, drug-fueled mayhem, mind you. In all of his works, he opines, philosophizes, and occasionally rambles. His subject is sometimes not entirely clearn, but his notions about life, love, and the state of the world at large continue to resonate today. He was fearless in his expression, never afraid to speak his mind. It’s writers like this that help us, even years after his death, to put things into sharper perspective. This piece was inspired by Johnny Depp’s portrayal of Hunter S. Thompson in Terry Gilliam’s cinematic adaptation of “Fear & Loathing In Las Vegas.” I hope you enjoy it. This is a years-old illustration inspired mostly by burning through several of Hunter S. Thompson’s books while licking my wounds after a failed relationship. There’s no obvious correlation between the devastation of lost love and the musings of an eccentric literary figure like Thompson. Losing somebody important is to feel lost oneself. Individuals like Thompson – with their preternatural ability to connect dots that otherwise seemed completely unrelated – have a unique ability to reveal the chaos beneath the order of things, and simultaneously make sense of the seemingly incomprehensible. Words written with authority, with a voice that punches through the banal, provide comfort. I think that’s why I’ve always gravitated toward the grandiose, sometimes absurd, and – more often than not – astute observations of the ‘gonzo’ journalist. My continuing series of Game of Thrones portraits continues with Renly Baratheon. This is arguably one of my most detailed paintings – I highly suggest you follow the link and take a look at it. This isn’t a photograph, but a painting based on a still frame lifted from the television series as a reference. Renly Baratheon is the third youngest son of House Baratheon, fourth in line to replace his brother Robert as legitimate heir to the King. His father served as Lord Paramount of the Stormlands, one of the constituent regions of the Seven Kingdoms. 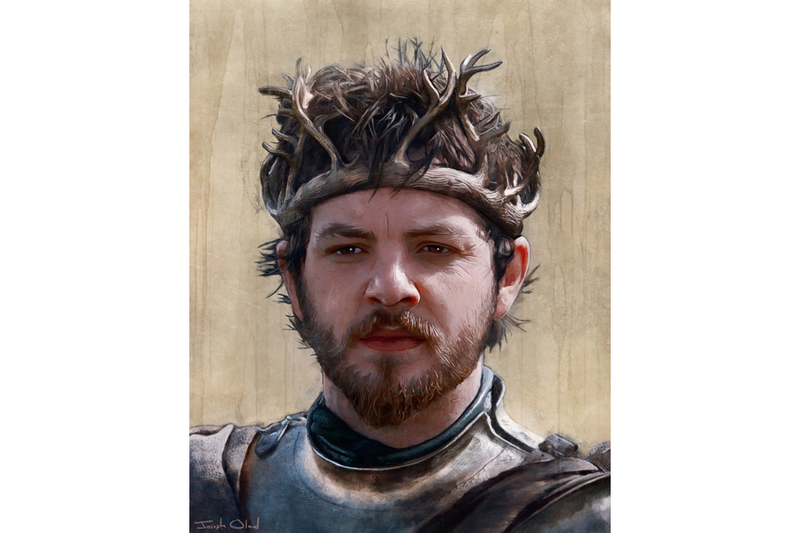 The least salty of his two older brothers, Renly is a reasonably untested fighter and inexperienced leader; he was too young to participate in the civil strife known as “Robert’s Rebellion” which ultimate saw his brother Robert seated on the iron throne. As always, I invite your input. Comments, questions, and recommendations are always welcome here. Who’s your favorite Game of Thrones character? Who would you like to see me illustrate next? Drop me a line in the comment section below!